First get yourself in the mood. Stick on All Along the Watchtower. Done? Good. For today's post I asked for suggestions that were Festival related. 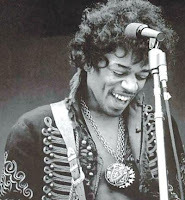 Almost unanimously Jimi Hendrix or the Isle of Wight Festival that he played at in 1970 were the shouts from the masses. What an amazing musician. Truly a one off, has there ever been anyone quite like him. Those three albums, Are you Experienced, Axis Bold as Love and Electric Ladyland all contain some of the best guitar playing of all time. When he played he truly made his guitar sing. Notes that shouldn't follow other notes followed them anyway, experimentation was key, and his influence is everywhere today. I try to personalise these Icon blog post so where does Hendrix fit in for me. Late teens I guess, some time after I discovered Zeppelin. Foxy Lady I distinctly remember watching a school band play in what was then Threads, a tiny club on the Isle of Wight. I think that was when I got interested. I didn't go out and buy all the albums, but I had a best of on tape at Uni and I can remember eating up All Along the Watchtower. Rarely has a Dylan song been brought to life in such an amazing way. And he was playing the guitar upside down. There's so much power to his playing but most of it sounds intuitive and natural. Sounds fit together in the right way even when they sound like they shouldn't and it's easy to get lost in the sonics. There is nothing I like more than cranking up a song and just feeling it through a decent pair of speakers and Hendrix produced music that is perfect for that. Ok his singing is not the best. Who cares? Being a maverick, using effects pedals to make sounds that no one had dreamt you could make with a guitar is Hendrix's legacy. Death came to soon for Hendrix (rumours persist that he was killed) but as is the way of the world it has only added to the mythos. You can't help but wonder what sort of music he'd be producing today if he was still around. And the wind cries Mary. Tonights post dedication can be argued over by @KatyHarwood, @WH1SKS and AT.